In February 2014, on a trip to Chicago, I used my first contactless transit card. It took a few times to get used to it but it was far easier than paying cash and deciding if I needed ro pay up front for a 2-hour transfer. If I bought a transfer, I had to keep track of it. With a contactless card there’s no problem paying the bus fare while wearing gloves. No fumbling with bills & coins. Just tap & go. My post from February 2014: Contactless Transit Smart Cards. I’d already contacted Metro St. Louis about being a reduced fare tester. 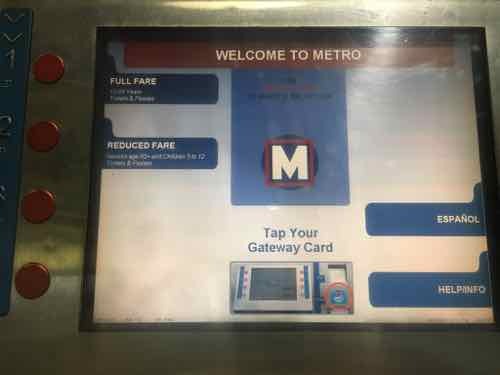 Metro was supposed to have such a system in place in St. Louis by then, but other cities, including Chicago, experienced huge problems when launching their contactless cards. Other delays happened tooo, but Metro has been cautiously slow. Metro has been working on the smart card system for more than eight years. 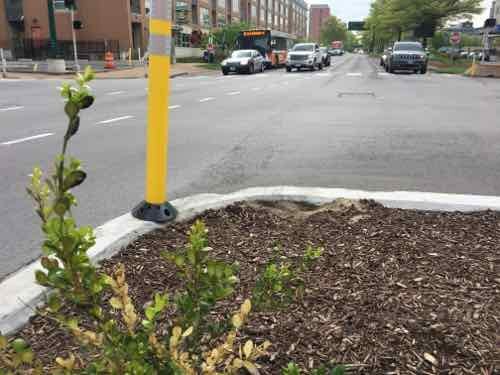 It’s part of a $31 million project that also included replacing fareboxes on all 400 of Metro’s buses, replacing or modifying ticket vending machines and validators and technical upgrades. Metro in 2011 had said the card system would be launched by 2013. Later the targeted launch date was changed to 2015. That also wasn’t met. I’ve been pretty patient as the months & years passed by. In November 2015 I applied for a reduced fare Ventra card for use in Chicago. It arrived in the mail the next month, prompt9ing me to write Reduced Fare Smart Card For Chicago, Still Waiting On St. Louis. In late 2017 I saw Metro’s now-retired Executive Director, Ray Friem, at an event at North Hanley. He explained the many pages of problems they’ve worked through and the few that remained. 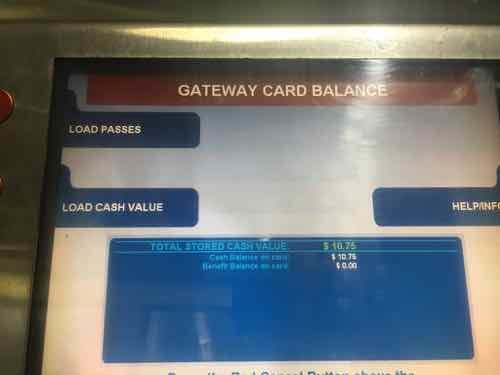 One issue was different vendors for bus fareboxes and a different one for MetroLink fare gates. 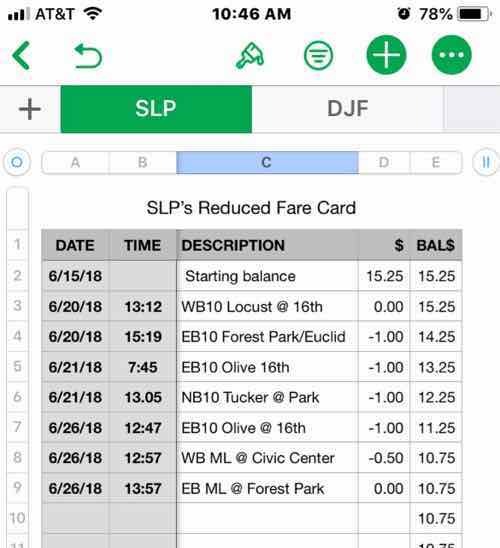 Earlier this year testing was opened up from a limited number of riders to sort of a public beta test — but still only full fare. I was getting inpatient. In March Friem promised me I’d be the first reduced fare tester. He was right, 3 months later I got my card! 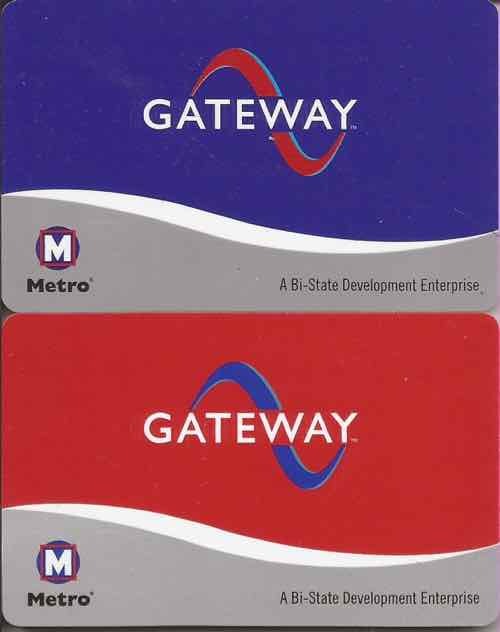 Standard fare cards are blue (top), reduced fare cards are red. The back of my husband’s full fare card includes tow card number and where to call Metro. 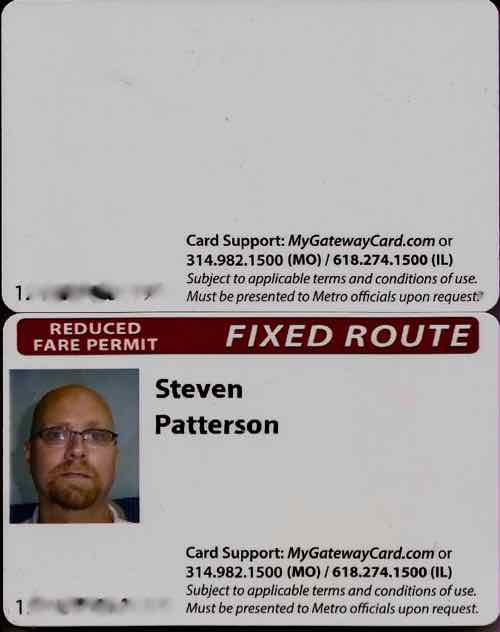 The back of my card includes my name & photo as well as card number — only the person assigned the card can use a reduced fare card, I’ve blurred both card numbers. I’ve now used the card 7 times — on both MetroBus and MetroLink (Light rail). My very first time using the card was on a #10 bus as I headed to an appointment with an ophthalmologist. It didn’t work. I tapped again, still didn’t work. The 3rd time it didn’t work the bus driver indicated to just wheel back to my spot so she could get going. I emailed the time, bus route, and bus numbers to the person at Metro I’d been working with for months to get this card. I managed to board the one bus, out of 400, that had a defective reader. Since then it has worked flawlessly, including a bus to MetroLink transfer last week! As these cards are still in testing mode, all the bells & whistles aren’t yet up & running. I can’t open an app on my phone to check transactions, balance remaining, or add funds. Can’t logon from my home computer either. I can check the by calling the number on the back of the card; I can also check the balance or add funds by visiting the Metro Store at 8th & Pine, or at a Metro ticket machine. 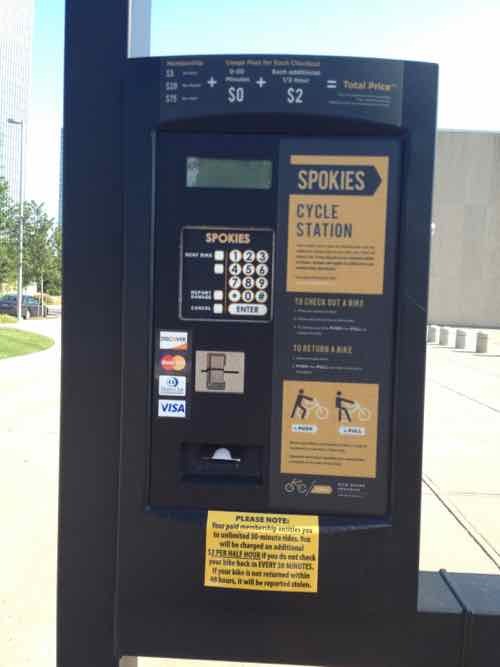 The machines at MetroBus centers & MetroLink stations have a reader you can tap your card to add funds, passes. or just check your balance. This day I checked my balance, $10.75 matched my spreadsheet. A Spreadsheet? Yes, I thought this was the best way to track my use and confirm the card is working. Because no app is available, I created a spreadsheet on my phone using Apple’s Numbers app. This allows me to track the balance of my card. This also helps me when I’m using Metro because the time will let me know the window in which I can use again at the transfer rate — exactly 2 hours. The other way to check the balance is to call the number on the back of the card. At first I’d call and thought something wasn’t working. Unlike Chicago, the bus data isn’t sent in instantaneously. it’s downloaded from each bus when it returns each night. The call-in system may not know my card balance at any moment because of this, but the card itself knows. Don’t think you can exceed your balance because the bus hasn’t downloaded yet — it doesn’t work that way. I’m told in a few months myself and others can begin testing the online portion. This will allow the autoload of passes or funds. I don’t use passes, but I love the idea of having it automatically charge a credit card I have on file whenever my balance reaches a minimum threshold. Aside from the one faulty bus reader, everything has worked fine. I’m looking forward to helping test online functions. I’m really glad I no longer need to carry a coin purse with $1 bill & quarters! As a result of the new convenience I find myself using transit more than I would have if I still had ro use cash or 2-hour passes. 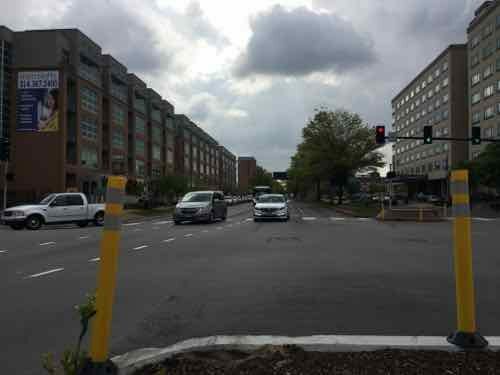 Sunday Poll: Which Northside Light Rail Alternative Alignment Is Your Favorite? 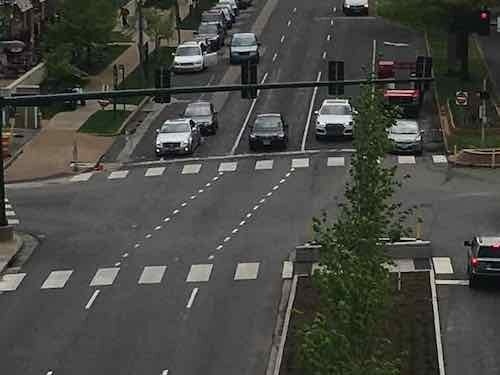 July 8, 2018 Featured, Public Transit, Sunday Poll, Transportation Comments Off on Sunday Poll: Which Northside Light Rail Alternative Alignment Is Your Favorite? Today’sSunday Poll is a little different than most, instead of agreeing or disagreeing with a statement you’ll be asked your favorite of two alternative routes for the Northside alignment of proposed new light rail line. 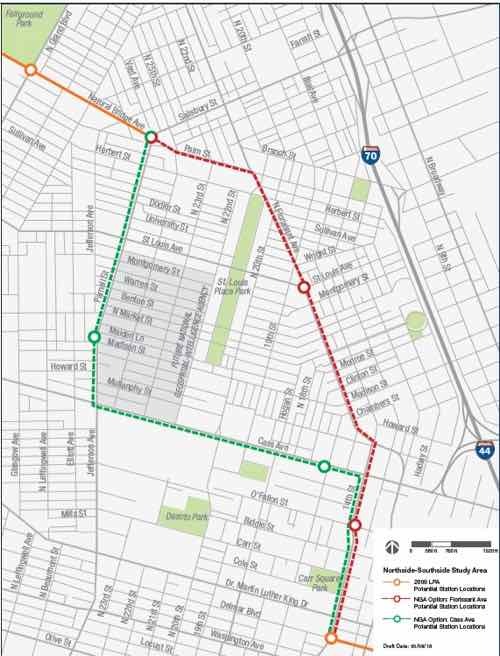 After a year and a half of data analysis, study and public feedback from over 60 presentations, meetings and open houses, the Northside-Southside Study team is releasing our recommended first phase project alignment for the City of St. Louis. We knew the best route for Northside-Southside should align with community investment strategies, serve area neighborhoods and residents, and provide pedestrian access to the National Geospatial-Intelligence Agency (NGA) West campus. 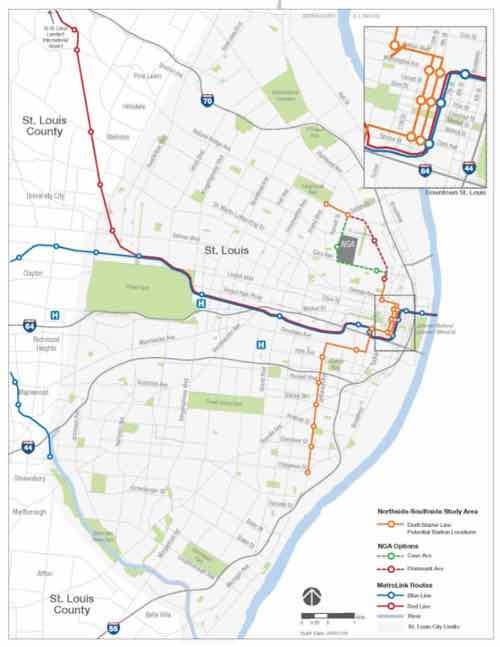 Thus, the study team is recommending to the Board of East-West Gateway Council of Governments, our metropolitan planning organization, a $667 million street-running light rail investment that would run from Chippewa Boulevard in the South through downtown to Grand Boulevard in the North via one of the two North St. Louis alignment options. See map below. Spur possibly millions of dollars in economic development throughout our neighborhoods. The study team will submit its final project recommendation to the East-West Gateway Board at its August 29th board meeting. The next step is to secure funding for an environmental study and project development, expected to take place during the environmental review process. 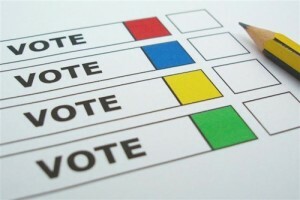 At this time, a preferred alignment through North St. Louis will be chosen. So the study team is recommending two a;ltermatoves North of downtown. Lots of pros & cons to each. The number of stations is the same for each. Either way Carr Square and what’s left of St. Louis Place neighborhood are served by either. So think about it and vote in the poll below. This poll will close at 8pm tonight..
Wednesday I’ll share the results, what I see as the pros & cons of each, and if I’ve made up my mind — my preferred alternative. Back in April I told you we got a high-tech newer car, a 2015 Hyundai Sonata Limited. At that point I hadn’t driven it much, had only used the adaptive/smart cruise control once. I have more miles behind the wheel now, including a trip to Springfield IL and a visit to the dealer in Wentzville MO. Yesterday we drove out to Chesterfield for the 31st annual St. Louis European Car Show. Adaptive cruise control uses a small radar (or laser) unit under the front grill or bumper that measures the distance to the vehicle in front of you. Many automakers will actually use two radars—one for close range and a second for vehicles that are farther out. The system uses this information to calculate distance and speed of the vehicle ahead and react to any changes to maintain a safe driving gap. In the event the vehicle ahead brakes suddenly, the system will either alert the driver or, in some cases, apply the brakes to prevent an accident. This short video explains in a visual manner. 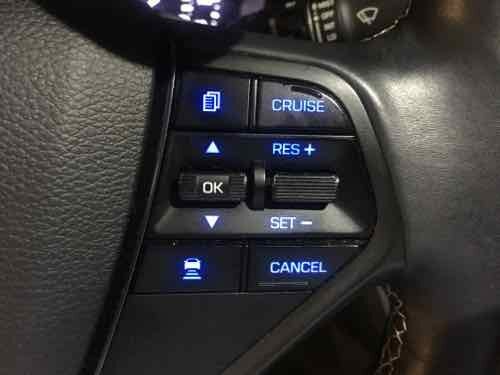 For many people, I think, cruise control is mainly used for long highway trips. I find I’m using our adaptive cruise control on surface streets –especially stop & go traffic. If you’re used to regular cruise control you know as soon as you hit the brakes in stop & go traffic it turns itself off. Our Sonata will bring itself to a complete stop — under the right circumstances. Our 2015 model was the first year of the current generation. Our Limited trim level has both optional packages. Hyundai, for some reason, decided not to include automatic emergency braking. They did for 2016 and newer models. Instead of automatically braking our car just beeps at you to stop. However, when the adaptive cruise control is in use and it detects a vehicle ahead it can come ro a complete stop on its own. Again, only under the right circumstances. If I’m following a vehicle that shows up on the cruise control graphic in the center of the gauge cluster and it begins to slow or stop our car will respond appropriately — including coming to a complete stop. It then tells me to hit the “resume” button to begin moving again. 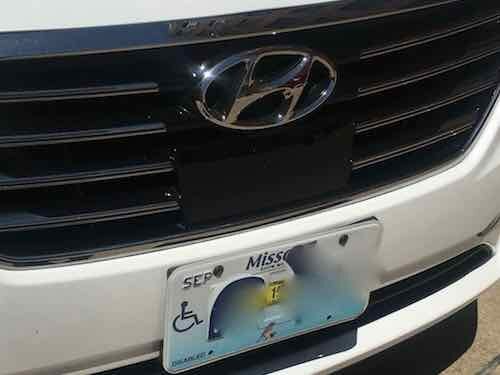 On our car the radar is behind the black black area just above the from license plate. The same year model without adaptive cruise control the chrome horizontal grill lines continue uninterrupted. At first I didn’t trust the system and I’d tap the brakes to disengage the cruise. Old habits. But with more experience I know now when to let it do its thing. Friday we came home from Overland MO in rush hour traffic. An Eastbound accident on I-64 was causing backups on to I-170. It was 5mph for a few miles, I had the cruise control on the entire time. Most of the time our car kept rolling in pace with the car ahead. A few times it had to stop so I’d hit resume once the cars moved again. Stop & go traffic is one thing I find highly frustrating, but adaptive cruise control makes it stress-free. Well, at least far less stressful. The carols on the right side of the steering wheel. There have been times we’ve been in the right lane and slow cars in the exit lane to our right makes ours think it needs to slow down. For the most part, however, it works as advertised. I must still stay alert because there are plenty of circumstances where our car won’t stop itself when the cruise its set. I can defiantly see how technology will get is to improved safety and self-driving cars. 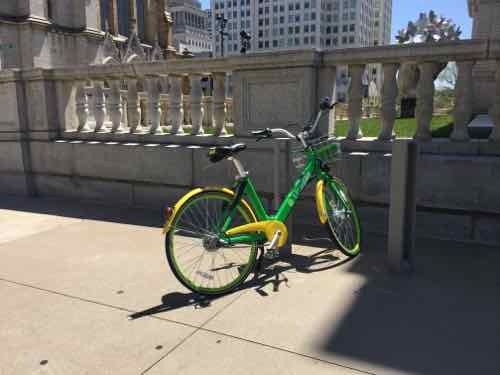 Docked & dockless? 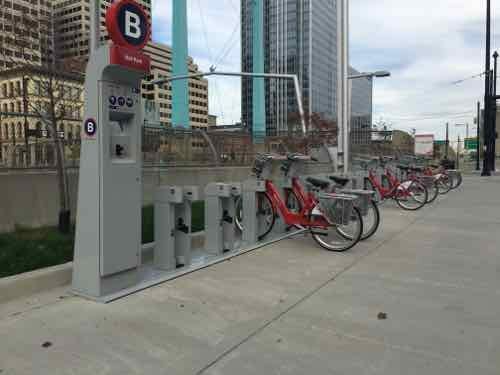 Let’s start in chronological order with docked bike share. 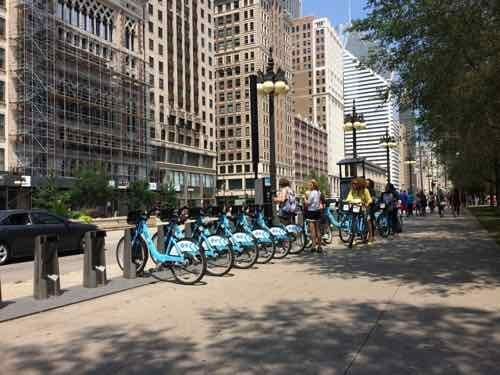 When we visit Chicago a few times each year we see the bike stations everywhere — not just in the tourist hot spots. 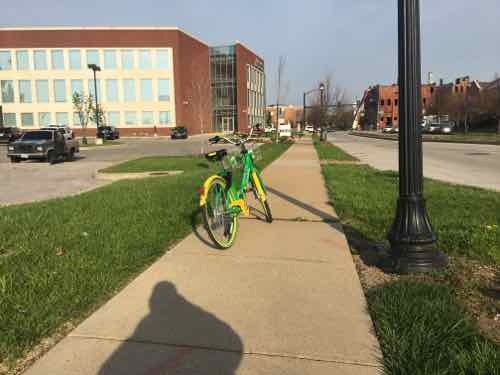 We also see the bikes getting used all over the city. 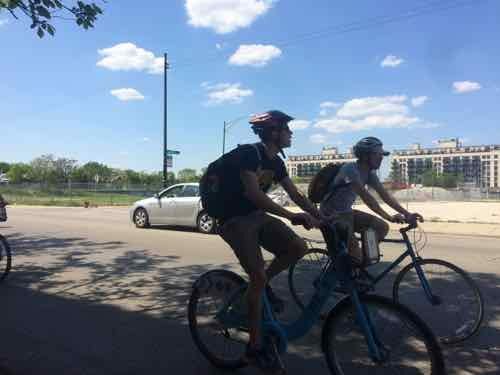 Chicago has a large biking community so it’s natural to see lots of use. What about other, smaller cities? 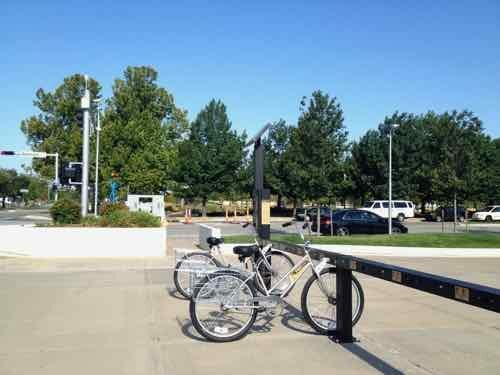 I’ve photographed docked bike stare stations in Cincinnati & Oklahoma City. Bike sharing has happened largely after my stroke, so I’ve not been a user personally. 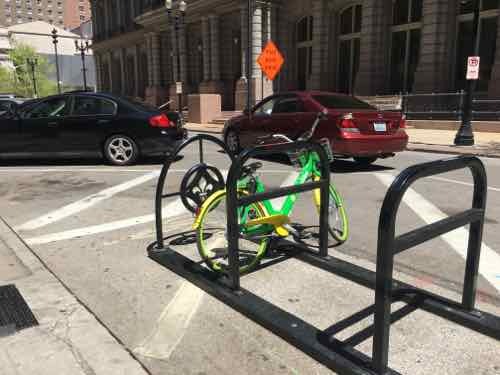 When I was in Cincinnati in 2015 for a Streetsblog event many in our group of bloggers would use Red bikes when we switched locations. Interestingly, I would often arrive ahead of them or about the same time — using my power wheelchair. This is because only one person can use a station at a time. So a station might be near your bus stop, office, or hotel but if there’s no station near your destination then it isn’t of any good to you. With the blogger group in Cincinnati a lot of their time was spent walking to/from stations to destination — in addition to waiting for others at the station. 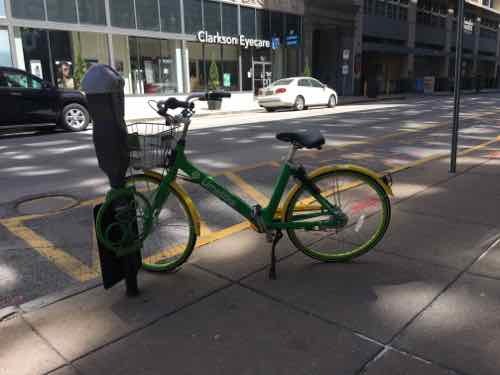 Dockless bike sharing has also frustrated many as bikes are left anywhere and everywhere. 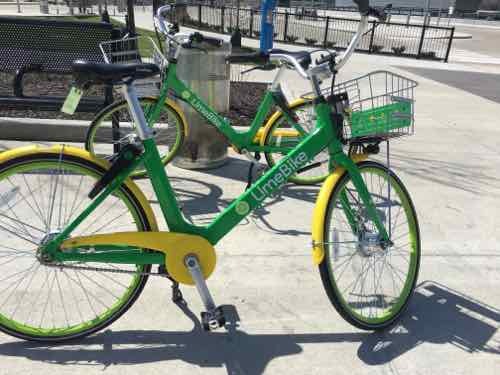 San Diego’s dockless bike experience has been more of a free-for-all than in most cities, because San Diego couldn’t make an exclusive deal with one operator without violating a previous exclusive deal with a rental company that requires bikes to be returned to docking stations. Even bike-friendly Amsterdam temporarily banned them — due to high demand for bike parking! 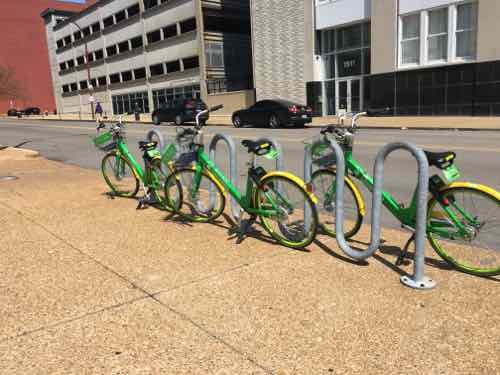 Which brings us back to St. Louis and the introduction of dockless bike sharing from Lime Bike — one of the two private companies to get a permit from the city. The bikes are very colorful. All are single speed with hand brakes, a bell, and a basket. A phone clamp is on the handlebar. This was the closest to being in my way, but I still had room to get by. Often I see them at bike racks, though they have built-in locks. Three at the same rack on Locust on another day. 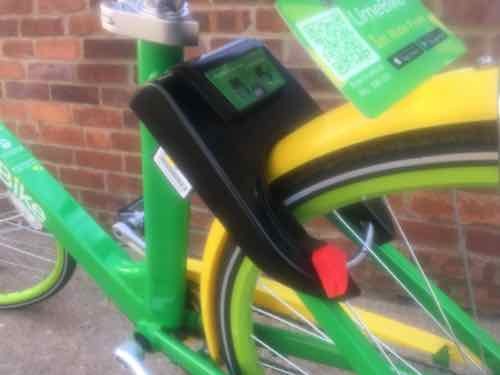 Once you’ve used the app on your smartphone this high-tech lock will retract the pin that goes through the wheel’s spokes. Zagster’s hybrid Pace system, which it’s rolling out in places like Rochester, N.Y., and Tallahassee, Fla., lets riders use docks or park elsewhere. 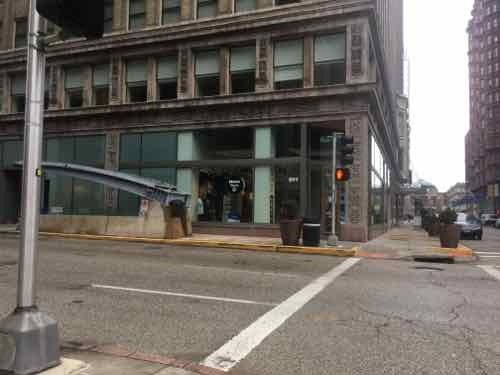 (Depending on the city, users may get charged more for parking without a dock.) But the bikes can’t be left free-standing; they have to be locked to something in order to end a trip. 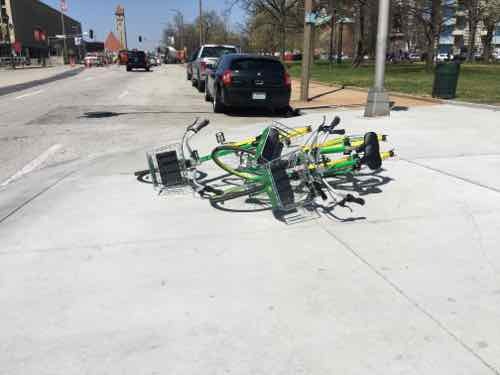 I’ve seen lots of people riding these new LimeBikes. those I spoke to were all quite pleased. The true test will come once the initial newness (and $3 credit) have worn off. I don’t doubt someone will leave a bike in my way, but I’ve been dealing with business signs, cafe tables, and dog poop as a wheelchair user for a decade now — it was 10 years ago today that I came home from 3 months of hospital/therapy following my stroke. While I can’t ride one of these bikes, I love seeing others riding them! 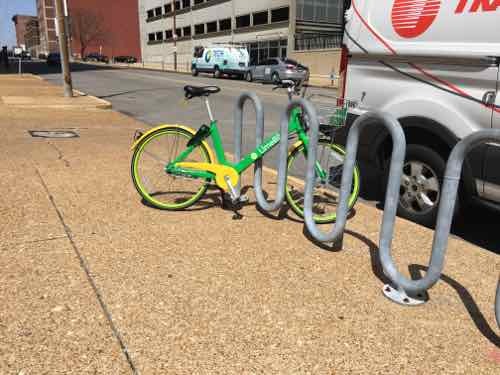 It’ll be interesting to see how both do once the 2nd permitted company begins offering bikes in St. Louis.